The court's newest member chatted occasionally with Justice Elena Kagan, who sits next to him on the bench. WASHINGTON — Brett Kavanaugh took his seat on the U.S. Supreme Court bench just after 10:00 a.m. on Tuesday and participated fully, as the court heard two cases about the kind of crimes that can trigger long prison sentences under a federal law intended to get repeat offenders off the streets. The court was the scene of raucous protest Saturday, after the Senate voted to confirm Kavanaugh. But only about 20 protesters showed up Tuesday. They chanted on the back side the building, where the justices drive into the parking garage, moved to the front for a brief demonstration, and left. Supreme Court police were prepared for much larger crowds and for the possibility that protesters might try to interrupt the courtroom proceedings. Waiting spectators were warned that any outburst inside the court building can be punished as a federal offense. But the two hours of oral argument went ahead in the normal manner. 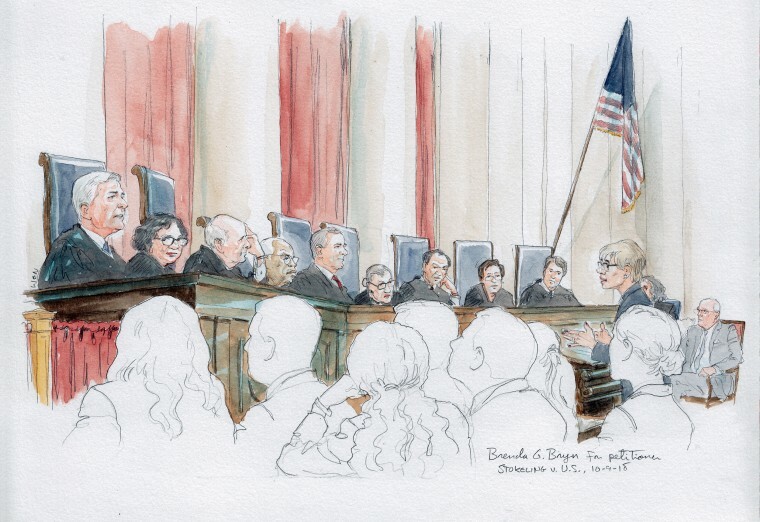 Chief Justice John Roberts offered the usual greeting for a new justice, wishing him "a long and happy career in our common calling." Kavanaugh chatted occasionally with Justice Elena Kagan, who sits next to him on the bench. Kavanaugh asked about a dozen questions during argument on the two cases, both involving challenges to the way states interpret the Armed Career Criminal Act. "Is a pinch, a ordinary pinch — let's not talk about an extraordinary — pulling of the ears that a parent might sometimes do. Let's talk about just a pinch. Is that sufficient force?" she asked. At that point, she illustrated her point by pinching Justice Neil Gorsuch, at her right, to laughter in the courtroom. Earlier Tuesday, the Supreme Court declined to review an environmental ruling written by Kavanaugh in his former role as an appeals court judge. The justices left in place Kavanaugh's August 2017 opinion that struck down an Obama-era Environmental Protection Agency rule. That rule was intended to limit the release of a class of chemicals that contribute to global warming. Kavanaugh returns to the courtroom Wednesday for the other two cases to be argued this week, involving detention of illegal immigrants and liability for asbestos injuries in the U.S. Navy.